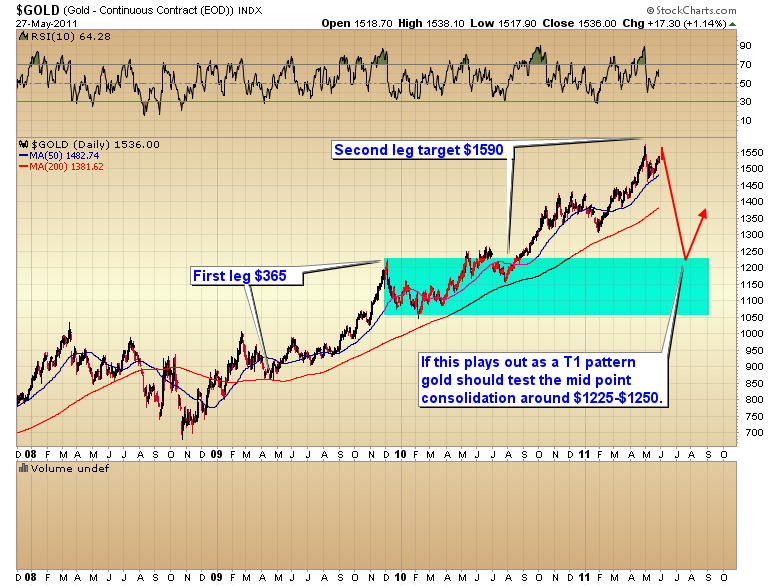 There is quite a bit of speculation lately as to where the impending intermediate cycle decline will take gold down to. Today I’m going to throw my guess into the fire. Some people expect gold to drop to $1400. Some $1300. Some even doubt that gold will ever go down again. However after watching gold for years and studying its history I think I can safely say that gold never misses an intermediate decline. Next week will be the 18th week of the current intermediate cycle. That means gold is now in the timing band for a bottom. If gold is in the timing band for a bottom a top can’t be far off. By a twist of fate these two major selling events should happen simultaneously this summer. 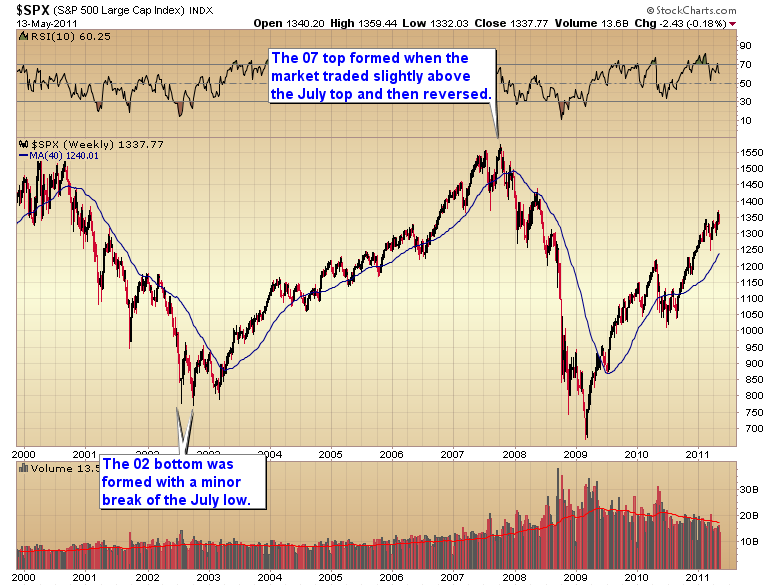 The combination of of these two major cycles bottoming together will almost certainly intensify selling pressure into the stratosphere. In an environment like that fundamentals will go right out the window. In theory gold put in it’s yearly cycle low last January at $1308. Barring something extraordinary I would not expect that low to be violated. However we could very well see something extraordinary. While the pattern isn’t “clean” there is an ongoing T-1 pattern in play on the gold chart that suggests that $1575 probably was the top of the current C-wave and if that is so and the T-1 pattern plays out as expected we should see a test of the the mid-point consolidation during the summer sell off. That consolidation zone for gold’s T-1 pattern comes in at roughly $1225- $1250. Of course I have no idea if this will play out as we move into the summer but if in July gold touches the $1250 level I think it will be the last great bargain we will get in the secular gold bull market. This entry was posted in Uncategorized on May 28, 2011 by Gary. 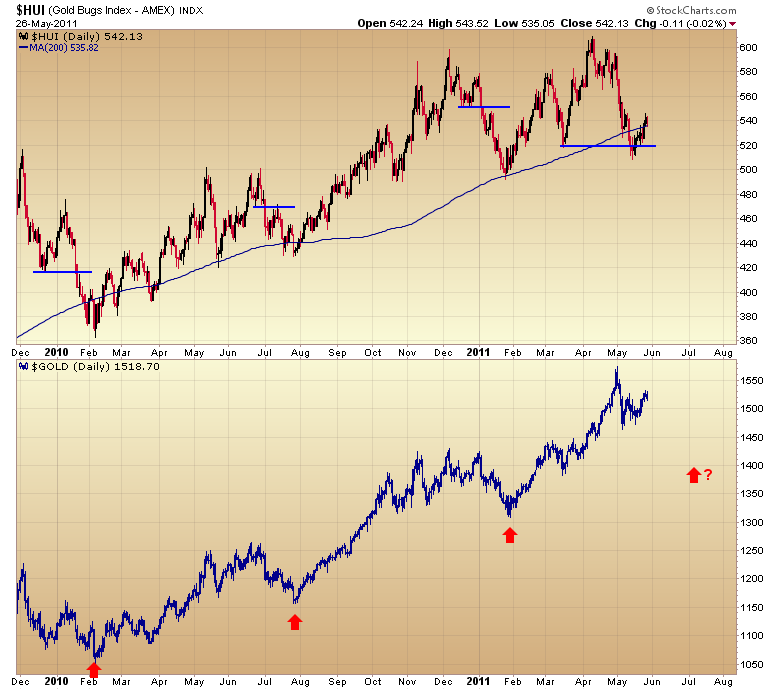 The debate lately is whether or not gold still has one more leg up. For the many reasons I went over in last night’s report I think it has become too dangerous to continue to play the long side in the precious metals so I don’t really care anymore whether gold is going up. 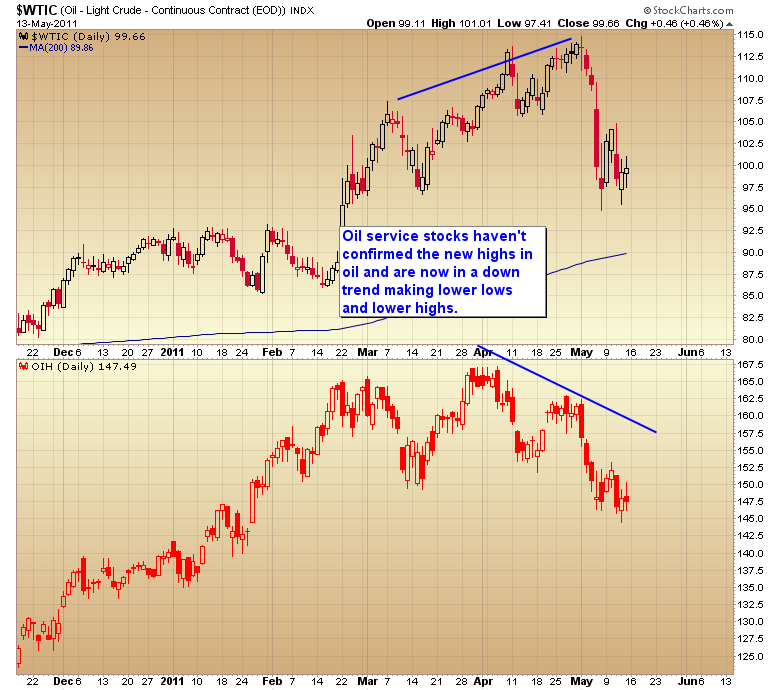 The risk is now high that one gets caught in an intermediate decline or worse a possible D-wave. Here is one more reason. The miners have broken below a prior daily cycle low. This isn’t a perfect signal. Of course nothing in this business works 100% of the time but this particular signal works about 80-90% of the time and those are the kind of odds it usually just isn’t worth bucking. You can see in the above chart that every intermediate decline in gold was preceded by the miners falling below a prior cycle low. That condition is now active in the current market. As a case in point a violation of a daily cycle low in gold is the main confirmation we look for to confirm that gold has entered an intermediate degree decline. I’ve marked the expected timing band for when the next intermediate low should bottom in late June to mid July. You can see that the summer low came last year in late July. The yearly cycle tends to run about 12 months on average so I wouldn’t expect this to be over for at least another month to a month and a half. As it stands today gold topped on week 14. That gives it a lot of time to grind lower. As a matter of fact every intermediate decline since this phase of the bull began has dragged gold considerably below the 50 day moving average and fairly close to the 200 DMA. That would suggest gold would at least move back to $1400 if this is just a normal intermediate degree correction. If this turns into a D-wave then we can expect at least a 38% retracement of the prior C-wave advance. This C-wave began in April of 09 at $860. A 38% retracement of that rally would drag gold back to roughly $1300. Folks this is what you are risking getting caught in by trying to squeeze the last few pennies out of this sector. Now if gold was doing what I think it should be doing I would be happy to hang on to positions. But it’s not! The weak dollar yesterday and today for that matter should be sending gold rocketing higher. So far it’s not happening. Combine this with the warning sign from the miners and I simply don’t want to play the game anymore. It’s easier to just wait for the intermediate correction or D-wave to run it’s course and then get in as close to the bottom as we can for a much safer trade and one we will be able to hold onto for 12 to 15 weeks with little fear of significant draw downs. This entry was posted in Uncategorized on May 27, 2011 by Gary. Another portfolio change has been made. This entry was posted in Uncategorized on May 26, 2011 by Gary. A change has been made to the model portfolio. 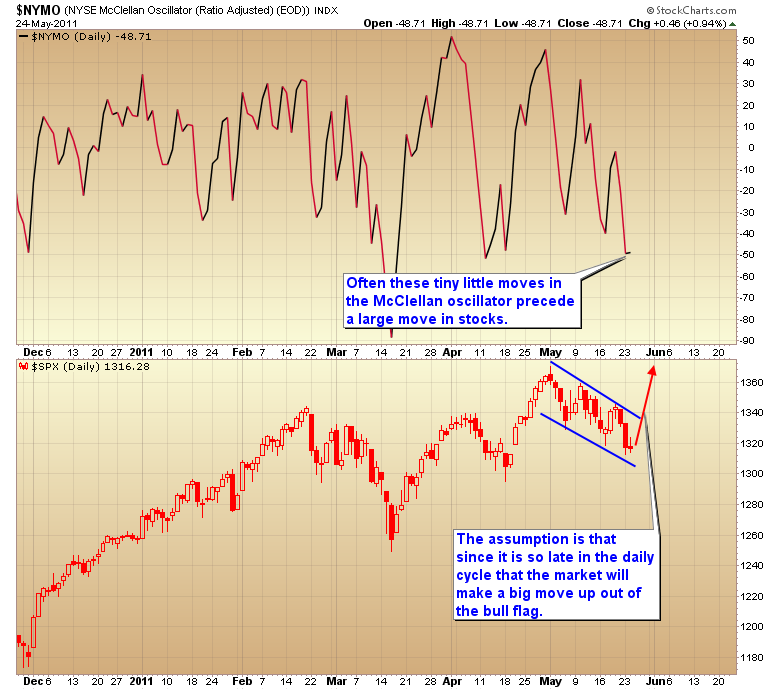 Often when we see small moves in the McClellan oscillator it proceeds a large volatile move in stocks. Kind of like a spring compressing. Since it is now very late in the daily cycle and sentiment has reached exceptionally bearish levels (especially in the Nasdaq) the assumption is that any day now the market is going to rocket higher out of the three week bull flag. My guess is we will get some news out of Europe that they have successfully kicked the can down the road for a few more months and the market will take off. This entry was posted in Uncategorized on May 25, 2011 by Gary. A portfolio change has been added to the website. This entry was posted in Uncategorized on May 23, 2011 by Gary. A portfolio change has been added to the model portfolio link and the stops for these positions have been added to the stops and trade trigger link. This entry was posted in Uncategorized on May 19, 2011 by Gary. Portfolio change has been posted to the website. This entry was posted in Uncategorized on May 17, 2011 by Gary. A morning report has been posted to the website. It is been my belief that stocks and the economy have been locked in a secular bear market since March of 2000. During that period we’ve had two recessions and two cyclical bear markets. One of those recessions was the worst since the Great Depression and the last bear market in stocks was the second worst in history. I’ve said all along that printing money will not cure the problem we’ve gotten ourselves into. It’s never worked in history and it’s not going to work this time either. We can’t solve a problem of too much debt with more debt. All we will accomplish is to make the problem bigger. We are now fast approaching the period when the next crisis should arrive. On average the stock market suffers a major correction about every four years. In a secular bear market that cyclical trough arrives as the economy sinks into recession and a stock market bear bottoms out. As we are still in a secular bear market then the move down into the four year cycle trough should correspond to another economic recession and cyclical bear market for stocks. Bear markets tend to last about a year and a half to two and a half years. 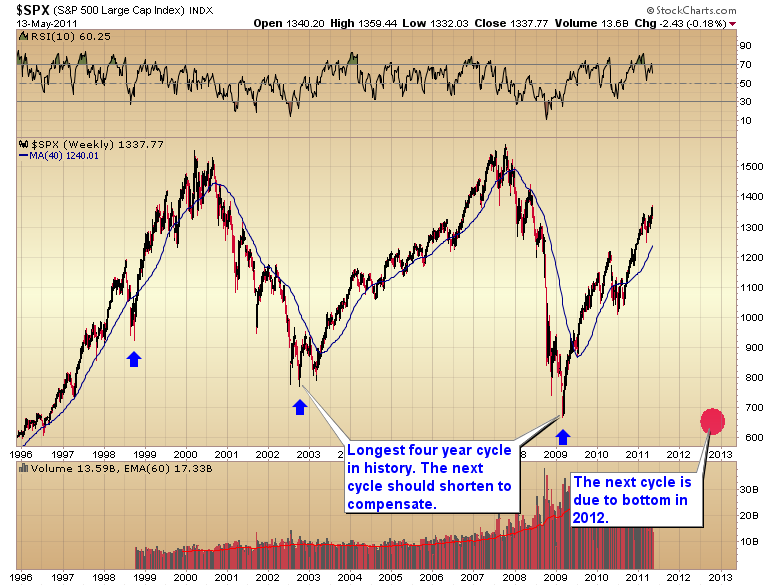 If the next four year cycle bottoms in the implied timing band then the current cyclical bull should be topping soon. 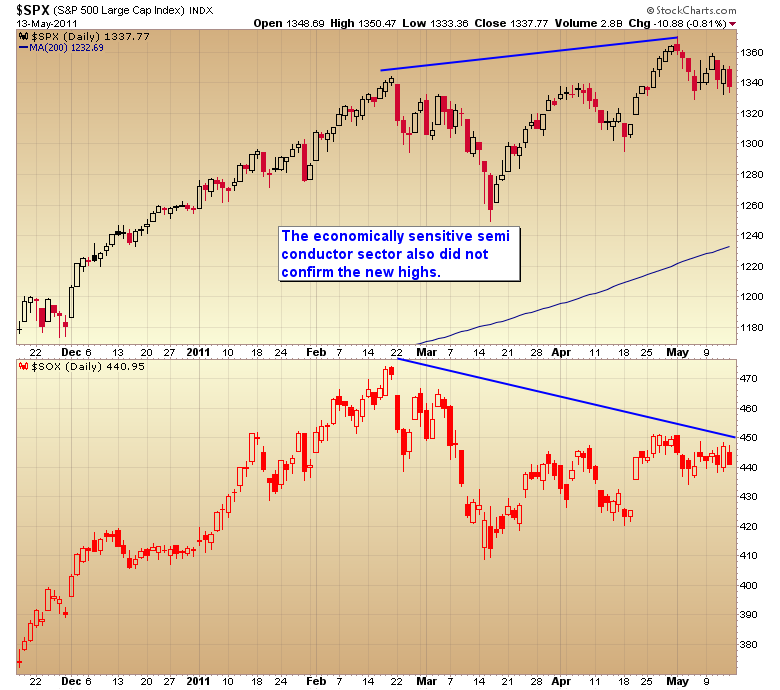 As a matter of fact the stock market is already flashing warning signs. Three of the largest and most important sectors in the S&P have not confirmed new highs. 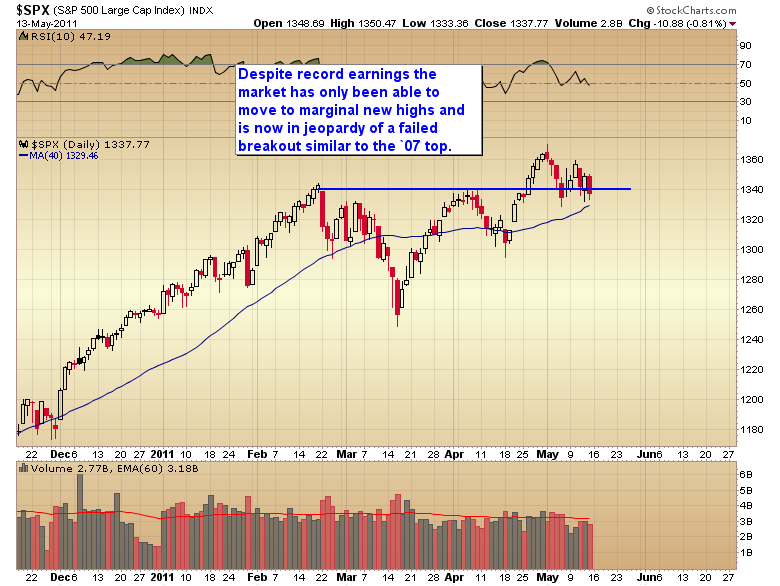 Another warning sign; Despite record earnings the market has only been able to move to marginal new highs and is now in jeopardy of reversing the recent breakout. I’ve noted in the past that this is how major tops and bottoms are often established. Smart money sells into the breakout, or buys the break down in the case of a bottom. 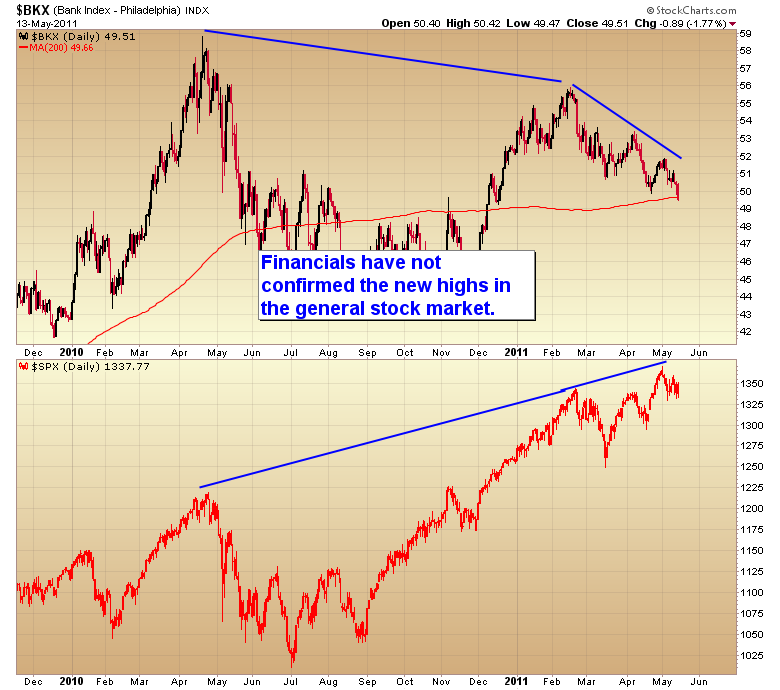 The trend then reverses and a major turning point is formed. Both the `02 bottom and the `07 top were put in this way. The market is now at risk of a similar event as we’ve experienced a marginal breakout to new highs that is threatening to fail. Don’t forget this is happening against a back drop of record earnings. When a market can’t move higher on good news something is wrong. And don’t forget bull markets don’t top on bad news they top on good. If the market can recover and move to new highs the cyclical bull will be confirmed, but if the market continues to fade and drops back below the Japan bottom it will constitute a failed intermediate cycle. If both the Dow and the Transports close back below the Japan bottom we would have a Dow Theory sell signal and that would confirm the next leg down in the secular bear has begun. It would also be a signal that the economy was unable to handle the spiking food and energy costs that were the direct result of Bernanke trying to prop up the financial system with his printing press. Like I said, printing money has never been the answer. Every empire in history has tried this approach and not one of them has ever succeeded with it. We won’t either. This entry was posted in Uncategorized on May 15, 2011 by Gary.